Lake Willoughby needs no introduction. 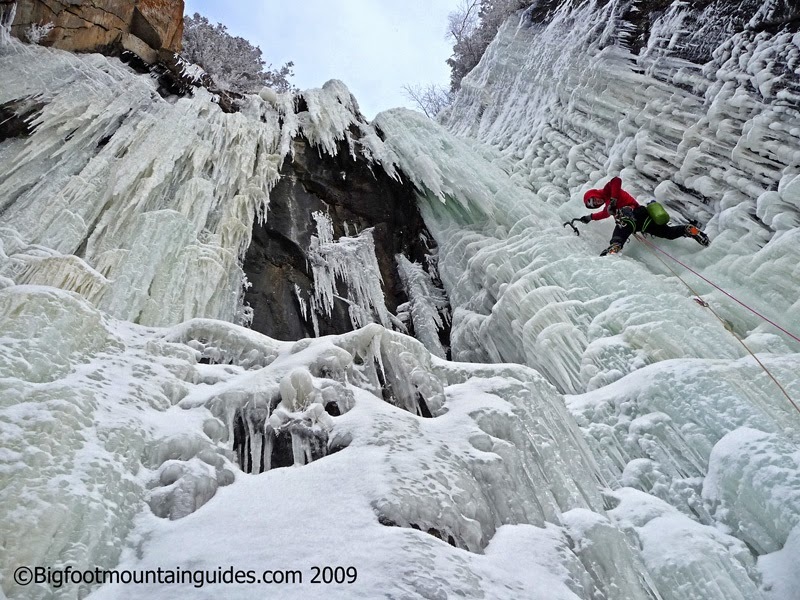 If what you want to do is climb multi-pitch ice routes in the United States there is no better venue. 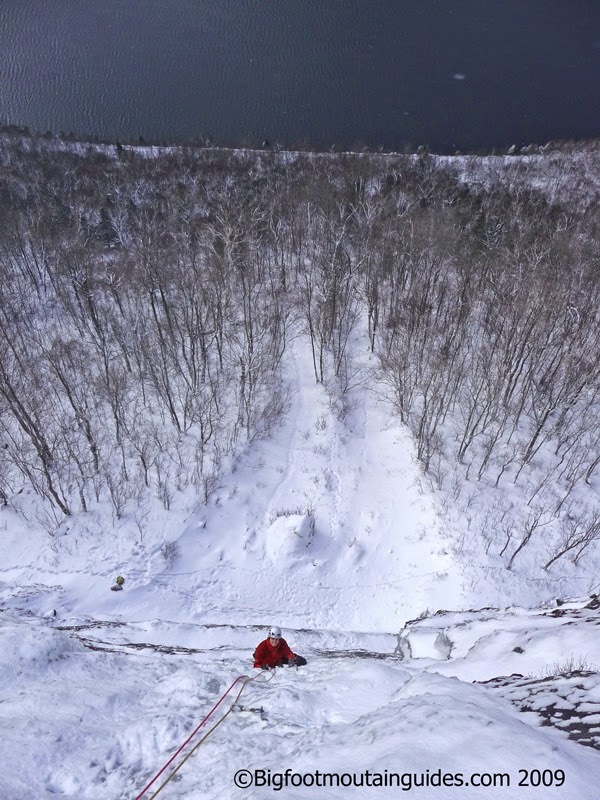 A 500' tall, .5 mile long cliff situated on a steep hillside overlooking the deepest lake in Vermont, "the Lake" as climbers call it, is the finest pure ice climbing area in the United States. Argue with me if you like, or just spend some time getting to know the place and likely you'll agree. 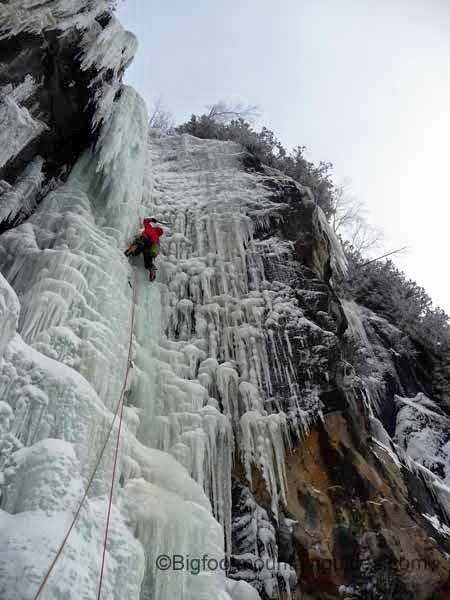 Living in southern New York state most of the year, it's a challenge to get to Willoughby at all during the ice season. It's not the first venue to form up and the late winter sun takes it's toll on the climbs. The window for climbing there is shorter than in the higher elevation, shady New England climbing areas. The past few years I've only climbed there once per season. 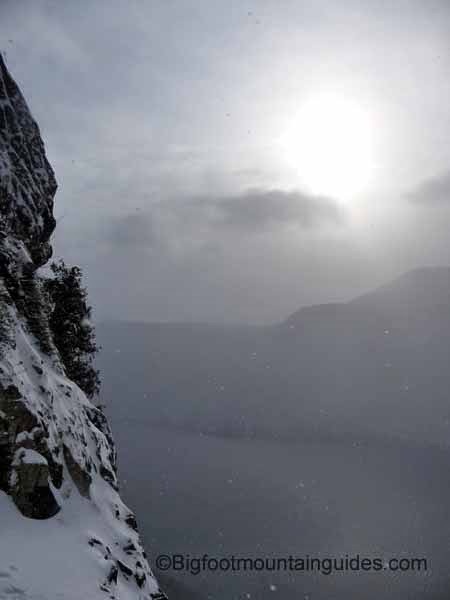 Several years ago, while living in Vermont, the Lake was my favorite climbing area, and I climbed there a few times a week during the winter. Since then my visits have been less frequent. 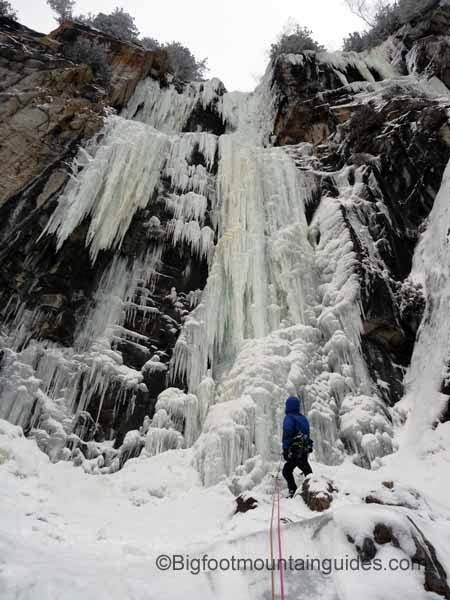 It's a challenging place to get to for most of us which really makes it a special place to climb. Another challenge, ironically, is finding a partner for weekday climbing. It's pretty hard to find reliable partners that have the same schedule as you when you work weekends. My partner for this day was Mike Wejchert. He's a young guy (23!) from Connecticut who's talented and experienced for his age. He's one of those fortunate individuals who's very motivated and was introduced to climbing by his father at a very young age. Mike is definitely a guy to keep your eye on over the next few years. 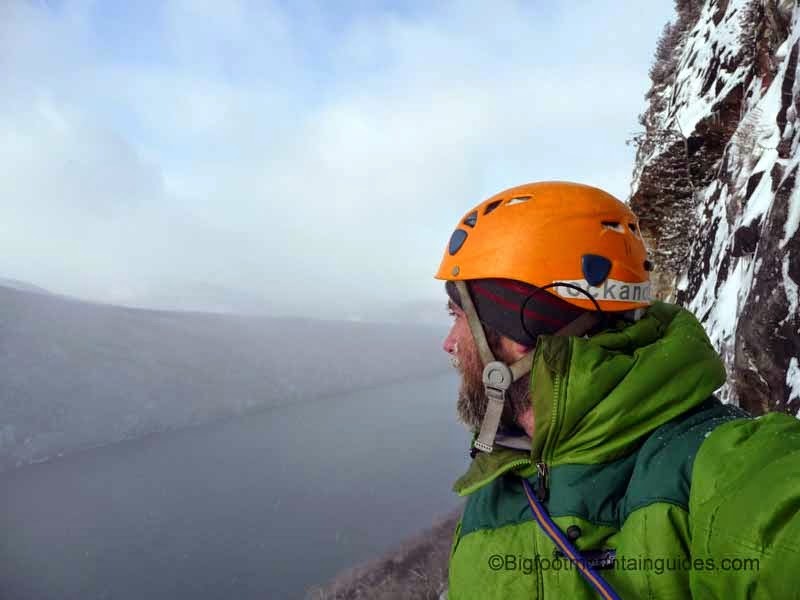 He seems psyched to climb big alpine routes and harder winter routes here in the northeast. The intention was to climb something I've never done before (long list); it was only Mike's second visit so he was psyched just to be there. I was hoping that Solstice would be in, but was just about willing to settle for any line there, they're all really good. Solstice was a no go. The sun was definitely out last week and the thinner climbs were looking a little baked. I was worried the bottom of Solstice might fall off under the weight of a climber, not to mention there's very little protection on the first pitch. We "settled" on Called on Account of Rains, which was in and is relatively close by. I followed this route several years ago and, knowing that the start was the psychological crux, was eager to lead the first pitch. The first pitch went pretty smoothly. It was unbonded and a bit hollow sounding (the norm for p.1 of Called). The following three pitches went very smoothly and Mike and I found ourselves on top of an amazing route in a beautiful spot. Climbing at the Lake is great, pure fun with a bit of terror mixed in. 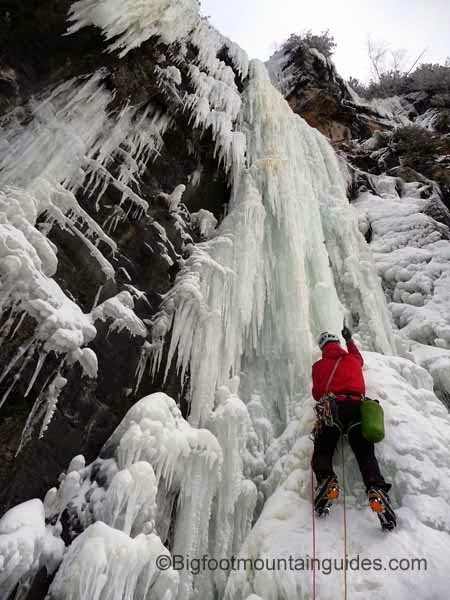 After all you are climbing enormous columns of ice that are, at times, barely attached to an exposed 500' tall cliff.